If you want to get up and running on Native & Search quickly, you do not need to create any additional ad groups. 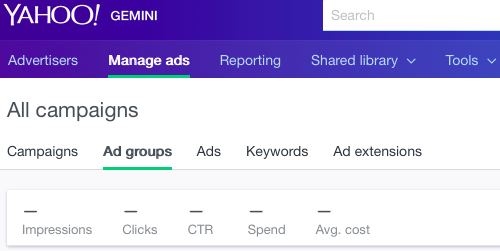 However, if you want to harness the full power of Yahoo Native & Search, you can optionally set up additional ad groups for your campaigns. 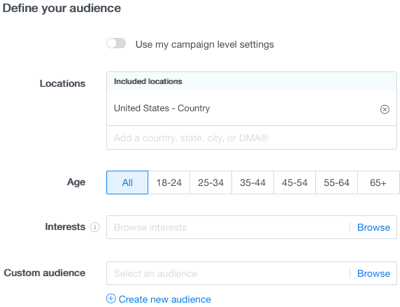 To set up additional ad groups, first create your campaign. Follow these steps to create your ad group. From Native & Search, go to the Manage ads tab. From the Native & Search Manage ads tab, select the link to which you want to add an ad group. 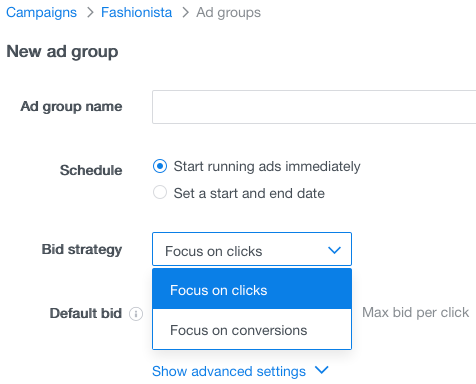 In the New ad group dialog, you name your ad group, set the dates you want the ads within your ad group to run, and set your Bid strategy (either with a focus on clicks or a focus on conversions). Finally, you set the Default bid: the amount in USD you are willing to pay on a Cost Per Click (CPC) or Cost Per View (CPV) basis. Select Start running ads immediately. Select Set a start and end date, and then select the dates you want the ad group to run. If you want to bid the same amount for native and search ads, set a cost per click (CPC) price. 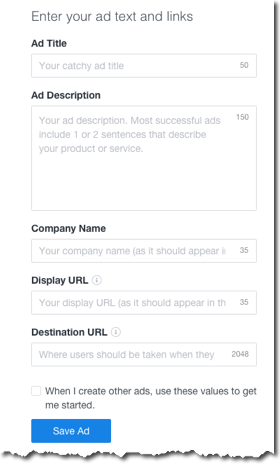 If you want to bid different amounts for native and search ads, click Show advanced settings, move the Set separate bids for native and search ads slider to the right, and and enter separate CPC amounts for each ad type. Defining your audience tells Yahoo Native & Search the types of people you to whom you want your ad to serve. If you want to use your campaign-level settings, you can skip this section. 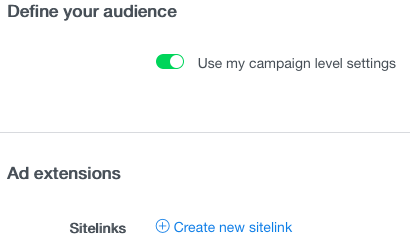 If you do not want to use your campaign-level audience settings, move the Use my campaign level settings slider to the right. Upload images that are common to all the ads in the ad group. Later, when you create ads, you can upload additional ad-specific images. Native & Search uses the large rectangle image to create a square image, but you can optionally upload a different square image if you like. Under the Large rectangle image, drag and drop an image or click Upload Image and browse to the image you want to upload. The minimum image size is 1200x627px and the aspect ratio should be 1.9:1. Optionally upload a square image. The suggested size for the square image is 627x627px, with a 1:1 aspect ratio. Create the text portion of the ad group. Use text and links that are common to all of the ads in the group. Yahoo Native & Search now provides support for Expanded Text Ads for Search campaigns. If you’re a search advertiser, you’ll have additional space now to craft longer and more compelling ad titles for improved user engagement. The table below describes these new features. Title 1 line, comprised of 50 characters. 2 lines, comprised of 30 characters. Description 1 line, comprised of 50 characters. 150 characters. Display URL Displays the URL that you’ve manually entered. For Native & Search Account Sync, the display URL will be automatically generated from the final URL and customized URL paths from your AdWords campaigns. For others, manually entered display URLs are still supported. Landing URL Displays the URL that you’ve manually entered. For Native & Search Account Sync, the landing URL will be automatically generated from one of your desktop final URLs and tracking templates from your AdWords campaigns. For others, manually entered landing URLs are still supported. Type your ad title in the text box. Your title can be up to 50 characters. Type the ad description. Your description can be up to 150 characters. Type your company name. Your company name can be up to 35 characters. You don’t need to include the “http://” but you should include the “www.” Your display URL can be up to 35 characters, and you need to use the same URL for smartphones, desktops and tablets. Type your Destination URL. This is the page that you want users to land on when they click on this ad. Your Landing Page URL can be up to 1024 characters. Click Save Ad to save this ad (the combination of the text, links, and images you entered). Take a look at your ad group content to see how it looks on different devices. Click the device icons and arrow icons to the right of the Text and links area to see if you need to make adjustments to any of your images or text. Provide a list of keywords you want to target in your search ads. Choose words and phrases that customers would use to search for your products and services.